When you tune in to the Bet365 TV commercials in Canada, you'll see a noted spokesperson, actor Ray Winstone, describe in-play and live streaming of sporting events, along with a number of other things. This is most definitely an operation that pulls out al the stops, including the sponsorship of sports teams and leagues. They are playing at a higher level than most. Bet365 is a massive operation that also accommodates canadian gambling. You may be aware of this already. But if you are in the UK, and you are not, you may be living under a rock. This is one of those full-service operations that covers every conceivable gaming product, and that encompasses not only the casino itself but also the poker room, bingo and sports betting. How big are they? Well, they have over 1700 individuals employed. So there is very little question about their ability to give the customer all the service in the world. As for incoming players, they have obviously figured out that a very easy way to satisfy them is to give them a great schedule of bonuses. 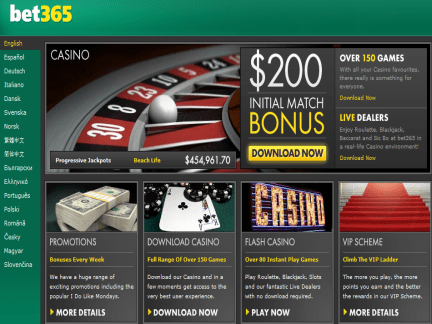 Bet365 splits up the operation we're talking about today into Casino and Games, the latter including, in their words, everything from slots to scratch cards that can be played without a download. Customers have the opportunity to realize a match bonus of $200, based on 100% of the initial deposit. However, there is also something special offered for those who choose to play slots only, in which cases there is 200% good for up to $400. Naturally, only wagers made on slot games are going to count toward fulfilling the wagering requirements. Bet365 has also made provisions to accommodate high-rollers, with the VIP Opening Bonus, in which 50% in match bonus funds can be rewarded, with the maximum bonus being $1000. And if you really want to carry through your VIP style, you should have no problem moving up the ladder, from the Bronze level to Silver, Gold and then Diamond, where you are going to be confronted with quite a few extras. All you'll have to do is keep playing and you'll be able to gather Comp Points, which you will be able to convert into cash. Honestly, there are so many different promotions here that it will make your head spin. There is a calendar that customers should access at the Promotions page in order to keep up with all of it. Between the bonus days, the free spins promotions, the Blackjack Bonanza and tournament action, there is plenty to keep anyone busy. And if you have been an especially good and loyal customer, you might get rewarded on Monday with an extra bonus. That's why they call that particular promotion I Do Like Mondays. There is a full suite of over 200 games that can be downloaded. There are a lot of scratch cards and slots in this section as well, along with table games like blackjack (with surrender and Pontoon), craps, roulette (five versions) and baccarat. Bet365 has nineteen different jackpot games as well that can be downloaded. Along with everything else, another thing Bet365 has that is so unique is the presence of not one, but two live dealer casinos. as you may or may not know, a live casino involves having human dealers in a remote location actually administering the games that are played by the customers on the computer, and in the case of Bet365, also now on mobile devices. There is the Euro live casino, which offers baccarat, roulette, blackjack and Casino Hold'em, and the Asian live casino, which features games that might cater more toward the Asian audience, such as Sic Bo. As you would expect, Bet365 has customer service people who are on the job 24 hours a day, They can be reached toll-free on the phone as well as by fax, email, and live chat. No surprises there. And it is also no surprise that there is a virtual plethora of different ways in which to make a deposit. when you go to the Banking section of Bet365's Help pages, you'll see that there is a drop-down box which will reveal all the deposit methods that are available in virtually every country in the world. When you go to the UK link, it tells you that the major credit cards - Visa and MasterCard - are available, as are Maestro, Visa Debit and Laser, not to mention Neteller, Skrill, PayPal, InstaDebit, Click2Pay, UKash, PaySafeCard, EntroPay, and of course, wire transfers and bank transfers. Almost all of these methods can be used to make withdrawals as well. You've got everything working for you when you go with Bet365!